Finding Eden: Santiago de Compostela day! We slept in a little later this morning and stopped for coffee on our way out of town. There was supposed to be only a little bit of elevation gain but we kept going up and down. By the time we stopped for breakfast I was so hungry I ordered a full meal and then immediately regretted it on the next up. Meanwhile Keith and Dina cruised along ahead of us. We caught up just outside of town (and only because they stopped to take pictures and wait for us) at Monto Gozo! I expected it to be a short walk into town from there but it took forever! 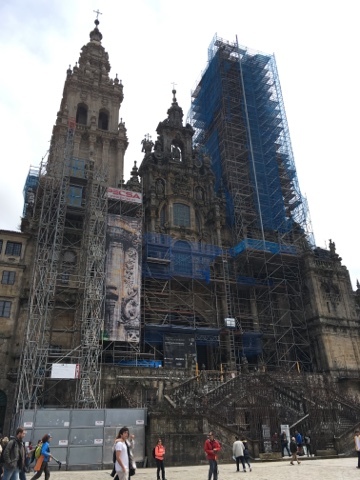 We finally made it to the Santiago de Compostela cathedral! I was disappointed though because it was being renovated and had scaffolding in front of most of the building. We decided we would come back later to check it out and headed to the pilgrims office where we could get our certificates. The line up was long! After waiting an hour, we decided we didn't really need the certificate anyway and went to find our albergues. It is really neat! We are on the third floor and from our window we can see the spires of the cathedral. The room which sleeps 12 has been divided into mini rooms for four that have a storage locker for each person and sliding doors that make each bunk area more private. I like it! After showering and laundry we wanted food and ended up having the cheapest meal so far! The food was great and we had the best wine so far but we ruined the savings by stopping for dessert later where we spent almost as much as on dinner. The pilgrims office was open till 9pm so we decided to go back and try to get our certificates again. This time there was only a small line so we decided to wait. Success! It seems silly to get a certificate for hiking such a small section especially when I compare it to the AT, maybe I should send away for that certificate too! Back at the albergues the set up here is awesome! We are in an ancient building that has changed mole rely remodelled. In the basement there is a kitchen/self serve cafeteria that has a walk out to a solarium. On the main floor there is a gift shop that has a really cool map of the Camino I am eying up.